Diabetes is a disease that affects the way the body uses food for strength and energy. Much of the food we eat is broken down into glucose, a form of sugar. When glucose enters the blood stream from the gut, it needs be used or stored by the cells. The hormone insulin is responsible for regulating how much glucose can enter the cells. The pancreas, a fist sized organ lying behind the stomach, makes insulin. The two most common forms of diabetes are type 1 and type 2. Type 1 used to be called juvenile onset, and type 2 adult onset, but since adults can have type 1 and children can have type 2, we don’t use these names any more. In type 1diabetes, the pancreas doesn’t make enough insulin. The glucose that should be going into cells increases in the blood stream causing high blood sugars. People with type 1 need to take insulin lifelong since we cannot live without insulin. Without insulin, excess glucose is not getting stored in fat cells, so people with type 1diabetes are usually thin. In type 2 diabetes, the pancreas is failing because it is overworked trying to make enough insulin to keep the blood sugars normal. Insulin is putting more and more glucose into the cells, storing it in fat cells and the liver. As these cells grow and multiply, they get resistant to insulin’s attempts to squeeze more glucose in. Type 2 diabetes develops over several years. The blood glucose stays normal as the pancreas makes increasing amounts of insulin. When the pancreas can no longer keep up with the amount of glucose it has to store, the blood level rises and we call that diabetes. Usually people with type 2 diabetes are overweight. The good news is that if the person loses weight, the cells allow the glucose to be stored and blood sugar can become normal again. High levels of insulin contribute to the development of high blood pressure and abnormal cholesterol numbers even while the blood glucose is normal. That is why you need to have your glucose checked if you are overweight, have a blood pressure over 140/90 or abnormal cholesterol numbers. 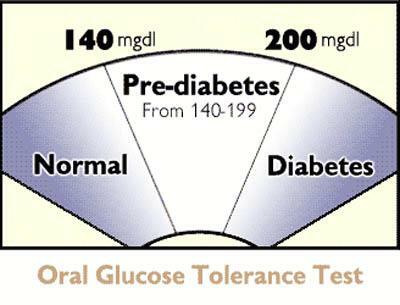 This diagram shows blood levels of glucose taken without fasting. Pre-diabetes is an in between state where insulin levels are going up, but glucose is still not at the diabetic level. This means there is an especially high risk of developing diabetes. People with prediabetes and diabetes have a higher risk of having a heart attack, a stroke and kidney disease. Healthy eating. Studies show if you are overweight, losing 7% of your bodyweight can prevent diabetes, delay its onset or improve it if your glucoses are already high. Since losing weight decreases your need for insulin, weight loss may also decrease blood pressure and help cholesterol numbers. www.choosemyplate.gov has recipes and easy advice for a healthy diet. My plate has replaced the food pyramid. Physical activity helps you lose weight, improve heart function, can decrease glucose and blood pressure and improves cholesterol values. Interestingly, increasing physical activity is the only way we know to decrease your chance of developing dementia. Plan 30 minutes of physical activity or more most days of the week. Need some motivation to make exercise a priority? You can win a Presidential Award for engaging in physical activity 30 minutes a day for five days a week, six weeks out of eight. See www.presidentschallenge.com or www.shapeupvashon.org for more information, tips and rewards.